During this morning's status briefing, launch officials announced all countdown activities are proceeding normally toward launch Thursday evening, and Space Shuttle Discovery and its International Space Station payloads are ready to fly. "Our systems are in great shape," said NASA Test Director Steven Payne. "The teams are ready." A cold front moved through Central Florida yesterday and the forecast calls for clear skies today and tomorrow, according to Shuttle Weather Officer Kathy Winters. However, another front is headed toward the spaceport on Thursday, and although it's expected to pass through the area prior to launch time, there is a possibility of isolated showers and low cloud ceilings lingering through the evening. For that reason, there's a 30% chance of weather prohibiting launch. Since weather is expected to deteriorate on Friday and Saturday, weather on Thursday will be the most favorable. The launch countdown began at 11 p.m. Monday at the T-43 hour mark. Included in the countdown are nearly 28 hours of built-in hold time prior to a targeted 9:35 p.m. EST launch on Thursday. 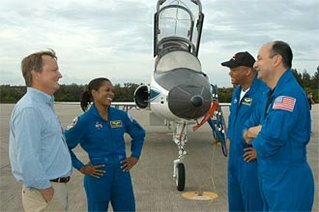 The STS-116 mission is the 33rd for Discovery and the 117th space shuttle flight. During the 12-day mission, the crew will continue construction on the International Space Station, rewiring the orbiting laboratory adding a segment to its integrated truss structure.